SIMON is a learning and school management system that frees up teachers to teach. It makes administering your school more efficient and improves teaching and learning practice, student reporting and assessment and parent engagement and communication. Schools that have experienced the benefits are passionate about its ability to reduce the administrative burden on class room teachers through functionality that greatly reduces the time taken to perform daily tasks. Its unique learning and behaviour management functions have been demonstrated to improve student outcomes and its school resource and HRM functions make the business of administering your school more efficient. To help review our software for your school, we have segmented our system features into three key areas, including Student Management, Learning and School Administration. To learn more about each area click on the sections below. SIMON’s browser-based software is fully responsive and will adapt effortlessly to desktop, laptop, tablet and mobile screen sizes. 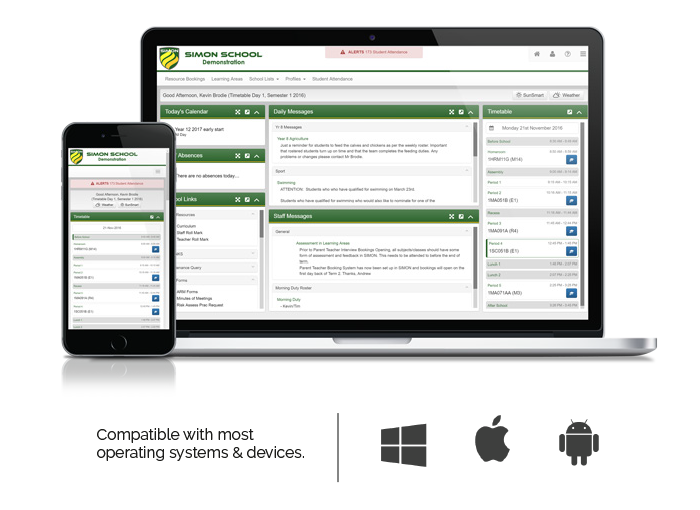 Our School Administration functions provide you with complete control of school communications, resources and your data. SIMON’s Learning Management functions are intuitive and user-friendly and based on our understanding of how teachers work. Our Parent Access Module (PAM) provides real time access to keep parents updated with their children’s progress, important dates and messages.